Afrah Nasser's Blog: Is there truly al-Qaeda in Yemen? Is there truly al-Qaeda in Yemen? This video is presumably showing people in Rada'a province; stating that the city was really seized by the Islamist group, Ansar al-Sharia'a and that everything feels good! Lately, there have been reports that the city was seized by al-Qaeda Islamist militants and that the government lost control over the city. For someone who knows little about Yemen, that may sound very horrifying news. But for most of people in Yemen -including myself- that sounds irrelevant to their day to day life. Life in Yemen has been as simple and peaceful as it could get. With all the hardships for many people in Yemen, they still managed to have a decent peaceful life. Before the uprising, Yemenis enjoyed tough but calm times. The over all economy was really bad; an average citizen's annual income was $1,140 for according to United Nations Statistics Division's report - 2009. That means that an average person used to have $95 per a month. Can you imagine what kind of a household anyone could have with that little money! Nevertheless, people were living life with grace. There is a great sense of collectivism in Yemen. It's a hidden social code; that everyone must help everyone. So, some rich people would usually help the poor and life goes on. My point is that life used to be really peaceful. No al-Qaeda rooming around! If al-Qaeda did truly exist in Yemen, I'd at least have known someone that has seen them. Only the government knows al-Qaeda. Hum! Strange! A big part of Yemen's culture is built on three factors. One is; tribalism. It's very important to proudly belong to a tribe because that's how the society acknowledges you. Tell me which tribe you belong to, I tell you who you are. Second is, carrying weapons. It's not only that it's a sign of manhood and prestige, but also it's necessary to secure a sense of protection when you live in a state that has weak control and governance. Additionally, carrying weapons has a historic-political background that I'll blog about in a separate blog post in the future. Third is, the majority in Yemen are conservative Muslims and that must NOT be interrupted as a negative thing. The conservativeness lies in Yemen's tradition. There are many aspects in Yemen's traditions that overlap with Islamic beliefs and rituals. I sometimes find it fascinating how people in Yemen mixe Islam with the traditions and vise versa. I'd like to give example of that but I'm sure not many will accept my examples so I prefer not to write. Conservative Islam in Yemen is a very sensitive issue but it's not a violent ideology within the religion. At all! Islam is a religion of peace and so is Yemen; a land of peace. There is no such thing like al-Qaeda and terrorism! It's just that Yemen's biggest problem is tyranny and corruption led by Saleh. 1-International media must not fall into the assumption that tribalism is terrorism. I personally come from a tribe in Yemen but that doesn't mean I'm a terrorist. International media must not confuse tribalism and terrorism (al-Qaeda). 2-Not only the international media, but the whole world must know that the "terrorsits seizing" this or that news is just one of Saleh's tactics and propaganda by the government to use it as an excuse for more international (the US) aid for the government military enhancement. Indeed, Saleh is one heck manipulative leader! Even before the Arab Spring, Saleh mastered killing. He fought people in the south with a fest of iron. Whereas, in 1986, Yemen witnessed the South-Yemen Civil War. Thousands were killed during that time and the world kept silent. Sa'adah province had its share too of Saleh's killing machine. Thousands were killed and another thousands became IDPs. 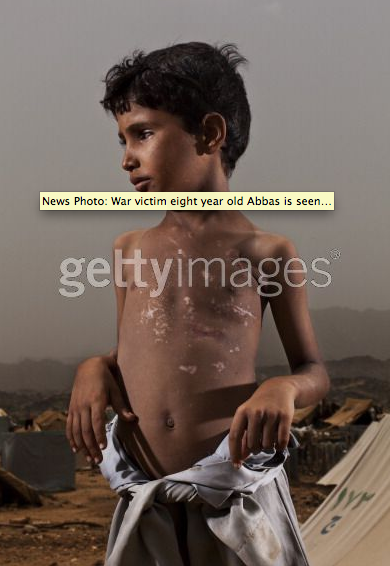 "AUGUST 2010: War victim eight year old Abbas, is seen at the Al-Mazraq IDP camps, Al-Mazraq, Yemen, August 14, 2010. Abbas was walking with his uncle in the Sa'ada region when his uncle stepped on a landmine and was blown to pieces. Shrapnel from the mine, ordinance from the war between Yemeni Government forces and the Al-Houthi Shiite group, sprayed into Abbas's chest and blinded him in one eye. Abbas's ten year old sister was also injured in the blast. They represent two of thousands of children at dire risk in this conflict. A shaky ceasefire reached in February 2010 brought a halt to the 6th round of conflict between the Government of Yemen and the Shiite Al-Houti group in the Sa'ada Governate. The situation is fragile and sporadic clashes are ongoing. According to UNHCR, around 316 000 Internally Displaced People are scattered throughout the five conflict affected governates of Hajjah, Amran, Sa'ada, Al-Jawf and Sana'a. Over 60% of these people are women and children. Food, water and sanitation needs are extensive and various child protection issues have also emerged, ie landmine and ordinance risk, war trauma and the recruitment of children by armed forces." When Yemen's government was cooperating with US drones to hit the so-called al-Qaeda millitants who just happened to be innocent civilance, journalist and blogger Abdul-Elah Haidar Shaye, made sure to expose their crimes. Then, he was immideitely arrested and sentenced 5 years in jail.